You are viewing Nicole Dolat's post archive. Not signed up for YALSA’s 2013 Hub Reading Challenge? Read the official rules and sign up on the original post. Anything you’ve read since February 3 counts, so sign up now! What makes this book so wonderful? As always, I struggle a bit trying to describe the magic of a really special book. Boy 21 is a book with fantastic male characters who are both typical and atypical for their geographic locations and experiences. It’s about basketball and astronomy, and about discovering there’s more to both then just playing the game or seeing bright lights in the sky. It’s about that one special friend who both embraces you as you are and also helps you to become more. It’s about learning to care about someone else’s life and, well, being more than your own. And it’s about discovering and valuing the things that are most important to you. In short, it’s just a really special book that I think just about any reader would enjoy. Have any of you made a really special discovery during the reading challenge thus far? If you’re not done yet, happy reading and keep us posted on your progress! Tweet your reviews and progress with the #hubchallenge tag, and we’ll see you at next week’s check-in! How is everyone doing with the challenge? I have to say, I’ve let myself slip a bit with some easy reading distractions (*hangs head in shame*). 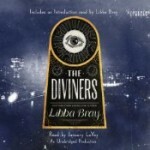 I finally had a chance to listen to the audio book for The Diviners. I feel like I’m in the minority when I say that I have not (personally) enjoyed any of Libba Bray’s previous books. (I tried, honestly I tried…) I had high hopes for The Diviners because so many people have raved — even people who report to not being huge fans of her other books, just like me. And I have to say, there was definitely a lot about this book I enjoyed. Sadly, our heroine Evie was not among them. And there’s always something about the way Bray tells a story that loses me — I find myself connecting to the story in fits and starts, but never being thoroughly engaged throughout. But I loved a lot of the support characters she created (Theta and Henry high among them). And the audio book was performed exceptionally well by January LaVoy, who created an immense number of entirely unique characters and moods through her voice. I really felt transported back to the 1920’s. So even if you’re not a fan of Bray’s works (like me), the audio book experience (thanks to January LaVoy) was a real treat. What kinds of books (paper or audio) are you loving … or not loving so much? If you’ve completed the challenge by reading or listening to 25 titles from the list, let us know by filling out the form (which actually works now!) below. (The information you provide is what we’ll use to send you your Challenge Finisher badge, contact you about your reader’s response, and notify you if you win our grand prize drawing, so be sure to use an email address you actually check!) Do not fill out this form until you have completed the challenge by reading 25 titles. One of my favorite picks from this years list of finalists for YALSA’s 2013 Award for Excellence in Nonfiction was Deborah Hopkinson’s book, Titanic: Voices from the Disaster. (You can see my previous post for my own detailed review.) Imagine my surprise and delight when Deborah offered to do an interview with me for our readers. What follows is the conversation that she and I recently had regarding her YALSA 2013 Honor Award, how her writing for Titanic evolved, and what her fans can expect from her next. Enjoy! First, let me congratulate you on winning a 2013 YALSA Honor Award for Excellence in Nonfiction with your book, Titanic: Voices from the Disaster. How does it feel to win an Honor award? Hopefully you had a chance to celebrate with family and friends! I was so surprised and honored to receive this award. I especially loved the format of choosing finalists and encouraging librarians and teen readers to become familiar with the books in advance. It’s particularly meaningful because I actually thought of this book as being appropriate for a wide range of audiences, and so I am glad it will reach teens through this award. April 15th, 2012 marked the centennial commemoration for the sinking of the Titanic. 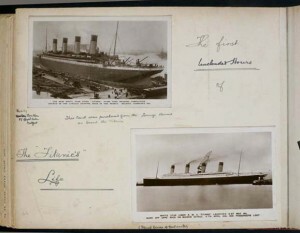 What makes the tragic story of the Titanic disaster so compelling, even 100 years later? You can study the disaster for social commentary about class distinctions (since a majority of the passengers killed were from the 3rd class passages — including women and children). The Titanic was a ship that clearly catered to the wealthiest of clientele, with services ranging from Parisian bistros to multi-room cabins that were probably larger than most New York City apartments. Third class passengers were restricted to the lower levels of the ship and prevented from even entering certain walkways onboard ship … which likely also prevented them from recognizing the urgency of the sinking ship. You can study the flaws in shipbuilding standards in the early 1900s and remark on how outdated benchmarks led to a sinking ship with only enough lifeboats for about half its passengers. You can shake your head at the unchecked ego of the captain and others who misread or ignored all signs that begged for caution. But really, what makes this story grab attention year after year (in my opinion) is the absolute tragedy of a truly doomed voyage across the Atlantic, where not one, but dozens of bad decisions and situations compounded to guarantee the Titanic would never reach New York City on its maiden voyage. Not signed up for YALSA’s 2013 Morris/Nonfiction Reading Challenge? Read the official rules and sign up on the original post. If you’re finished, fill out the form at the bottom of this post to let us know! I, personally, was very excited about this particular reading challenge. Why? Because I never seem to carve out time to read nonfiction titles. I read an article online recently (I’m kicking myself for not noting the link) that said something to the effect of, “a nonfiction book is good if it engages the reader and convinces him/her to read about subject matter that they might not normally have any interest in.” Makes sense, right? But how do nonfiction authors get us to pick up those books? YALSA’s upcoming YA Literature Symposium will explore the future of young adult literature. The symposium begins on November 2nd, but we wanted to get a head start here at The Hub, so we’re devoting October to 31 Days of the Next Big Thing. Each day of the month, we’ll bring you forecasts about where YA literature is headed and thoughts on how you can spot trends and predict the future yourself. Even as libraries started to build momentum in adding some “core” manga to their collections (Fruits Basket, Naruto, Death Note, and so on), major publishing firms responsible for English translated versions of many popular series started to close up shop (e.g., Tokyopop) … which meant that I was left hanging on many series I was very much addicted to reading. (The series were ongoing in Japan, but the English translations had ceased to exist.) And following the trend of many printed magazines, Shojo Beat and others stopped doing print runs of their publications. I know I have seen many listserv discussions of people asking where they can find magazines about manga and anime (with pretty much Otaku USA being the only major magazine still available in print form). So where does that leave fans like myself, who want to support the mangaka who create the works I love (and avoid visiting fan-driven and not-quite-legal scanlation sites online)? It may seem grim, but all is not lost. New Readers’ Choice nominations are in! YALSA’s Readers’ Choice Award is one of those rare opportunities where individuals can literally just champion their favorite YA titles of the year. Teens, librarians, teachers … any fans of YA literature can vote. See a book on the current 2013 nomination list you also love? Or think that the best YA title of the year is sadly absent from the list? Use the suggestion form to make sure that the best titles published between Nov. 1, 2011 and Oct. 31, 2012 make the final ballot! The more nominations a title receives, the better. If you haven’t had a chance to visit the Readers’ Choice site yet, here are some basic guidelines for you. Titles from just about every genre are allowed: Horror/Thriller; Mystery/Crime; Nonfiction; Realistic Fiction; Romance; Sci-Fi/Fantasy; and the “wild card category” for this year … Dystopia. You want to make sure that any title you suggest is widely available in the United States. Oh, and one of my favorite guidelines: “popularity rules.” No fussing over critic reviews and prestigious review journals — for all intents and purposes, if you love the book, it qualifies. Read the “>full guidelines and policies if you want more details. Continue reading New Readers’ Choice nominations are in!